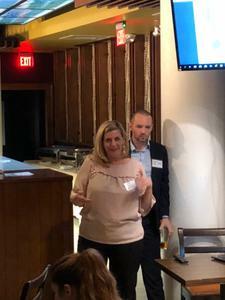 Last month we had the privilege of hosting clinical trial researchers from the University of Pennsylvania at the first iConnect.edu networking event in Philadelphia. Penn researchers are using the iConnect Patient Recruitment Management System to establish a robust online presence for their research studies, and also to centralize and track their patient outreach activities. TrialX was able to meet some of these researchers and get a ground level view of their iConnect experience. Guests were invited to partake in informal discussions about their research and use of iConnect. The wide range of cutting edge research happening at Penn was reflected in the attendees who came from the Departments of Oncology, Cardiology, Ophthalmology, Gastroenterology and Psychiatry. During the event, the TrialX team presented their latest iConnect case study highlighting its impressive patient recruitment enhancing capabilities, like the automated recruitment campaign tracking feature. The number of iConnectors adopting the outreach tracking tool tripled this past year, aided by enthusiastic researchers spreading the word amongst their colleagues. In 2018 every department at Penn used iConnect to help manage recruitment for their clinical research studies. As a result, a huge amount of data is being fed into the system, helping Penn to develop an advanced and comprehensive set of recruitment campaign models. In 2019, Penn patient recruitment strategies will be aided by these iConnect models, and success will be measured by increased levels of participation in clinical research at Penn. According to data shared by the National Institute of Health, 75% of all research recruitment sites in a given clinical trial are unable to meet their enrolment targets. Of these 27% fail to enroll even a single patient. University of Pennsylvania is working on hundreds of clinical trials, but not all trials are funded adequately enough to spend on advertising. Moreover, in general, most of the time researchers are not able to plan and direct their budget properly to recruitment. With little funding at hand, it becomes all the more important for researchers to use tools like patient facing pre-screeners to get the most out of their advertising efforts. iConnect allows researchers to pre-screen their subjects, reducing time and effort involved in contacting each patient. A good example is the POAAGG (Primary Open-Angle African American Glaucoma Genetics) study that was able to successfully reach their recruitment goal in just 6 months by effectively creating their outreach campaigns and tracking with iConnect. A break down of their outreach identified which outreach generated the most referrals, best conversion rates and also a cost per patient breakdown per outreach in general. Such breakdown will help drive future recruitment efforts for their department. The ultimate goal of the POAAGG study is to facilitate the development of rational, targeted screening, diagnosis and eventually novel treatments for african americans having Primary Open-Angle Glaucoma. We shared the success of this trial with the group to illustrate how full use of iConnect can not only help teams meet targets but also yield meaningful recruitment data that identifies most effective means of advertising. We strongly recommend you to visit http://trialx.com/iconnect and check out the video. iConnect team looks forward to help more study teams reach their recruitment targets effectively, in a timely and cost effective manner. Co-written with Erica Alshehabi & Robert Ryan, VP Clinical Trial Solutions, TrialX Inc.